Buckle believes that good business starts with good people doing good and giving back, as this drives the fundamentals of success. From participation in charity events sponsored by United Way, Make-A-Wish Foundation and American Red Cross, to offering and encouraging company health and fitness initiatives; we set our goals high when it comes to the well-being of our teammates, guests, and their communities. The American Red Cross – Buckle understands the growing need for blood donations in hospitals, and hosts multiple blood drives for teammates throughout the year. Buckle also understands the impact The American Red Cross makes through disaster preparedness and recovery, and participates in local fundraisers. The United Way of the Kearney Area – Buckle supports the good stewards at United Way who identify needs and distribute funding through multiple agencies which support education, income, and health-related needs in our community. Buckle encourages teammates to participate in United Way-sponsored campaigns. The S.A.F.E. Center – Buckle supports the S.A.F.E. Center’s mission to assist families dealing with domestic violence and/or sexual assault. Buckle contributes to the fundraising efforts of the Safe Center, including their annual Purse Auction to which Buckle donates various purses, watches and jewelry. Buckle teammates also adopt families, identified by the S.A.F.E. Center director, during the Holidays to gift clothing and other desired wish list items. Goodfellows – Buckle joins local volunteers to donate, wrap, and deliver Christmas gifts to over 1,250 children in need. Food Pantries – Buckle teammates volunteer to donate, collect, and distribute non-perishable food to local food pantries: Jubilee Center, Commodity Supplemental Food Program and the Kearney Food Pantry. 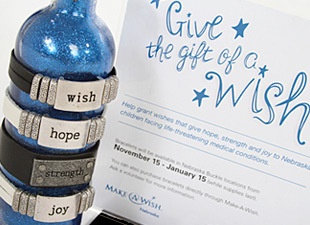 Make-A-Wish Foundation® – Buckle believes that this program offers opportunities to truly impact families and their children with life-threatening medical conditions. Each year, Buckle chooses to design merchandise for the organization and donates a portion of each sale to the foundation in Nebraska. Kearney Area Animal Shelter – Buckle understands the necessity of providing shelter for homeless animals, encouraging pet population control, and preventing animal cruelty and neglect. In support of the Kearney Area Animal Shelter, Buckle worked with the shelter's charity, Soles 4 Paws, to collect lightly worn shoes that were given to ShoeBox Recycling in exchange for a monetary donation. ShoeBox Recycling is a for-profit organization that delivers shoes to countries in need. Buckle Teammates did their part by collecting almost 5,000 lbs. of shoes, raising $2,481 for the shelter. Boys Town – Buckle believes in the Boys Town mission to strengthen children, families and communities in America through programs that instill values of faith, safety and family engagement. Buckle continues to donate clothing to the Boys Town Clothesline - a place where kids in need can go to find new outfits for school, helping to develop a sense of confidence and aiding in their healing process. Read the full article here. Buckle is proud to carry merchandise from vendors who also support various community groups and charities, and is excited about the possibilities available when selecting future vendors who have initiatives in place that impact their communities. Below are just a couple initiatives offered by long-standing vendors we commend for sharing our goals of giving back and doing good in their communities. Hurley’s “Living the Dream” movement makes dreams come true for children and adults with life-threatening afflictions, by creating the opportunity to take part in various events, such as concerts, backstage meet and greets, and other fundraising events. Good Work(s)’effort to sell beautifully crafted accessories, of which 25% of the net profits are donated to good causes, provides support for organizations, including the Jennessee Center and Children Uniting Nations. Watch the video to learn more about Good Work(s).